Airtel, country’s largest mobile operator comes with competitive onnet tariff packs for its customers in Kolkata. Airtel’s new STVs offer local Airtel to Airtel calling (applicable for Airtel numbers in Kolkata, West Bengal and Sikkim ) at just 30 paisa /min any time of the day. As competition heating up, Airtel has to response to onnet tariff reduction, and they did. Airtel’s two new special tariff vouchers are made at a cheap price of Rs.34 and Rs 78 respectively. 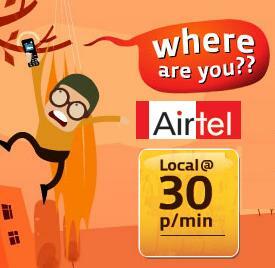 Airtel STV Rs.34 is offering Local Airtel to Airtel calling tariff 30 paisa per minute for a period of 60 days. and Rs.78 offering more value for money, as it is offering local Airtel to Airtel calling tariff 30 paisa per minute for a period of 365 days. Airtel currently also offering local call rate as low as 50 paisa/min including Airtel numbers, so new STV 34 and STV78 are good one from Airtel.